To strengthen the US Postal Service's online chops -- and give augmented reality technology some bonafide useful marketing implementation -- AKQA/DC developed the virtual box simulator. Here's how it works: you print a little eagle off the website. (This is so the system knows how big your item is, relative to something else.) Switch on your web cam and launch the Virtual Box Simulator. Hold the eagle up to the camera until a virtual box appears, then toggle the size to best suit whatever item you plan to ship. Banner Not Dead! Twitter-Powered Banner to the Rescue! In the "why didn't I think of that first category," comes this new ad unit from SocialMedia for JuicyJuice which allows people to tweet from within the banner. If people are logged in, their tweet will scroll up and appear on the banner. 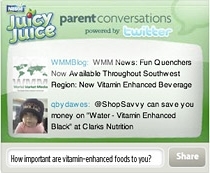 Juicy Juice teamed with SocialMedia to place the ad unit on mommy sites such as BabyCenter and CafeMom. Different questions, "How do you stimulate your child's mind?" or "How important are vitamin-enhanced foods to you?" are asked. As SocialMedia CEO Seth Goldstein notes, the tweets and corresponding hashtag extend the effectiveness of the banner saying, "The ad unit is paid placement but the additional impressions are effectively earned media." Oh Twitter, how others continue to find ways to make money off your VC-funded back. Just how long are you going to let others rip you off before you realize you can't run on fume indefinitely? Make sure you sniff some glue before watching this Sub Rosa-created video or Diesel's fragrance, Only the Brave. Or smoke some weed. Or, better yet, heroin. No, we're not advocating drug use. It's just that the trippiness of this whacked creation would likely be be far more enjoyable under the influence of something. To get us all worked up over the Beatles library making its way to Rockband, Passion Pictures put together this sweet video with nods to famous moments from the Beatle's contribution to the world of music. It's very well done. Even people who have heard o the Beatles (do any exist?) will love it. Check it out on Creativity. OK, so Chicago Lake liquors is an "urban" liquor store with low prices. Why? Because "urban" people can't afford higher prices? Because suburban white people are cheap and have no problem traveling to "urban" space to get their freak on? Because you can never get enough Crystal or Hennessy? Aside from all those potential cause group-style alarm bells, this campaign for Chicago Lake Liquors from Brew is not afraid to go all Vanilla Ice on us with every over-done white-guy-goes-black tactic in the book. 'This is just so ... hippy dippy happy!' Steve said. Wawa's pushing its yearly Hoagiefest new media-style: with the requisite Facebook, and online video, etc. etc. But like last year, the campaign's big deal-breaker is a song commissioned by Parry Gripp. 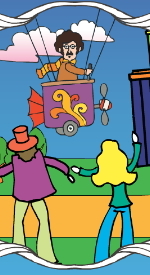 Witness the magic at hoagiefest.com. The animation, unabashedly high-pitched music and the prospect of a fresh hoagie lights up our innards like psychedelic pot. For Steve it conjures up Woodstock "with maybe a little Up With People thrown into the mix" -- for me it's totally Beatles circa Sgt. Pepper's Lonely Hearts Club Band. Soften Their World -- Before They're Too Big to Fight Back. We've heard it said that we'll always be about five or six years old in the eyes of our parents -- no matter how much we accomplish, how old we really get, or where on our bodies our hair starts to grow. 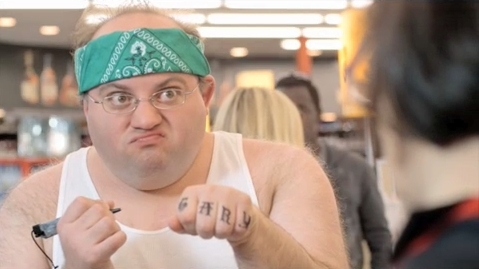 Which is why this campaign for UK-based Fairy hits home in a manner both awkward and charming. Each spot depicts a generic Gen-Xer getting infantilized by his mom, who despite old age (and complete senility?) hasn't lost any of the maternal instincts she possessed in the prime of motherhood. 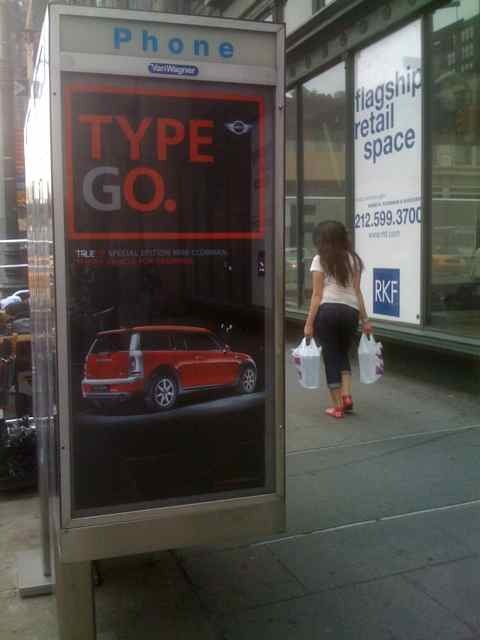 @AskACopywriter managed to catch the phone booth ad at left, fruit of a liaison between BMW's Mini Cooper and -- oddly enough -- HBO's True Blood. You may have noted that, in July of last year, True Blood orchestrated this pretty cool YouTube effort where vampires worldwide apparently produced their own amateur videos and tried demanding suffrage from the narrow-minded living. This Mini partnership is another way to work that "vampires among us" angle: Mini is among a handful of brands that will be targeting their campaigns to vampires through June 14th, the start of Season 2. It's Like 'Conjunction Junction,' But So Much Hipper. EUTube -- the YouTube channel of the European Union -- is seeding a video called "Electrical Derby," whose job is to educate viewers about electricity, while propagating the Eurotrash pop culture aesthetic that gives spoofs like this a perpetually appreciative audience. After a few watches we're fairly confident we'll be experts in how batteries work; but every time we start the video up again, we get caught up in fantasizing how RAD it would be to spend a few hours at a neon roller derby. We like the idea, but imagine trying to explain supermagnets at a rave. 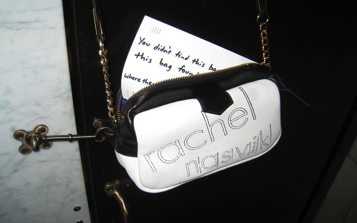 (Actually, it's possible we've done that -- and it all went horribly wrong.) In any event, "Electrical Derby" is a follow up to "Chemical Party," last year's attempt to teach chemistry with synthesized music and mating rituals.